Each director shall be a natural person and shall be an employee of, or shall formally be affiliated with a Voting Member as an independent contractor otherwise, but no more than one (1) director may be an employee of or affiliated with any one (1) Voting Member at any time. Any director of the association may be removed with or without cause by a majority vote of the Voting Members at any annual meeting or special meeting called for such purpose. Any director who satisfies the qualifications for a director set forth in Section 4.1 as of his/her election, but subsequently ceases to satisfy such qualifications prior to the end of his/her term shall be deemed to have resigned as of the date he/she first fails to satisfy such qualifications, and the remainder of his/her term will be considered a vacancy to be filled by the board of directors as hereinafter set forth.. Any vacancy occurring on the board of directors through removal, resignation, or failure to satisfy the qualification set out in Section 4.1 above, or an increase in the number of directorships shall be filled by a majority vote of the remaining directors then in office, even if less than a quorum, or by the sole remaining director, in such case. Any director chosen by the board of directors as aforesaid shall hold office until the next election of the class of directors for which such director has been chosen, and until their successor is elected and qualified. The 2010 NCHN Annual Conference will go down in NCHN history as another record breaker in terms of attendance and outstanding sessions! Approximately 150 members, staff, presenters, HRSA Network Planning Grantees and staff, exhibitors, and guests attended the 16th annual event in San Antonio, Texas, April 19-21. The conference began on Sunday afternoon with a special workshop offered by NCHN Silver Level Business Partner, Paradigm Learning. Participants were treated to an afternoon of learning about and playing an abbreviated version of Zodiak, their award-winning business acumen simulation. Zodiak is a fun, fast-paced simulation that shows healthcare workers how their actions and decisions impact the bottom line. Participation in the workshop helped members recognize that outstanding patient care and good business decisions are not mutually exclusive. The pre-conference workshop was followed by a Welcome Reception where NCHN members and guests renewed friendships and met new colleagues. The two and a half day conference was filled with educational and networking events. Participants had a variety of workshop topics to select from, exhibits to visit, and networking opportunities both during and after sessions. Monday night participants enjoyed the Texas Cavaliers River Parade from the 3rd floor balcony of the Hard Rock Café. Over forty (40) lighted floats participated in the annual River Parade and NCHN conference participants and guests had a great view of this spectacular event! On Monday, the 2nd Annual Awards luncheon was held and three NCHN members were recognized by their peers. 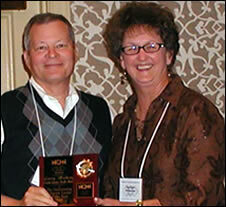 In addition, NCHN presented a new category, the Friend of NCHN award. Details about the Award Winners are below. Congratulations to the 2010 award winners and nominees! The 2010 HRSA Network Planning Grantees also attended the conference and had special training on how to implement their newly funded projects. All thirty (30) new projects were represented at the conference. During two panel presentations, NCHN members shared their experience with grantees, discussing challenges of establishing and managing a network. In addition to meeting with their Technical Assistance Provider from Georgia Health Policy Center, grantees received information on what they should do when they get home and begin implementing their project, including grant management, reporting requirements, and how to formalize their networks. Conference sessions included discussions on a wide variety of topics. Several sessions were offered by NCHN members that shared their expertise and successes. The Conference Program, along with the power point presentations from the sessions are available here (pdf). Make plans now to attend the 2011 Annual Conference, which will be held April 17-20, 2011 in Scottsdale, AZ! On April 19, 2010, the National Cooperative of Health Networks Association (NCHN) announced their second national award winners during their annual conference in San Antonio, Texas. Cindy Large, Executive Director of the Indiana Statewide Rural Health Network (InSRHN), was selected as the recipient of the NCHN Outstanding New and Emerging Network Leader Award. The NCHN Outstanding New & Emerging Network Leader of the Year Award recognizes extraordinary leadership activities demonstrated by a new health network leader with less than five years experience in the field. Award winners were nominated and chosen by their national peers. Large served as the leadership for the initial grant application which gave rise to the Indiana Statewide Rural Health Network in 2008. She assembled partners with the expertise and connections to rural heath, to create a cohesive group of hospitals in rural Indiana, that are working together to improve the quality of and access to healthcare in Indiana’s underserved communities. In just two years, Large has created a fully sustainable network based on a unique combination of membership fees, grant collaborations and partnerships, usage fees and administrative fees. The InSRHN provides an extremely low cost, high return, model to provide each member with substantial return on investment for their time and financial commitment. In 2009, under Cindy’s leadership, the Network achieved a 477% return on investment for its individual members. 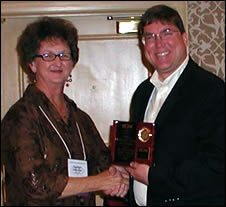 Larry Matheny, Coastal Carolinas Health Alliance, was selected as the recipient of the NCHN Outstanding Network Leader of 2010. The Outstanding Network Leader of the Year Award recognizes a network leader with at least five (5) years of experience for leadership in managing a successful health network organization. This award is meant to be inclusive of all types of health networks, alliances, collaboratives, and consortiums. Award winners were nominated and chosen by their national peers. 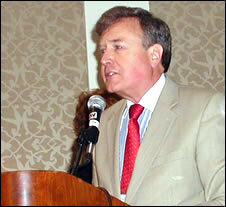 Larry Matheny has served as President of the Coastal Carolinas Health Alliance (CCHA) since 2005. Since its inception in 1993, CCHA has served not-for-profit hospitals in North Carolina, placing a major emphasis on regional group purchasing contracts. During Matheny’s tenure, savings have gone from $2.3 million to $5.7 million, an average of over an eight to one (8:1) return on investment. CCHA has concentrated on grant writing and has been awarded several grants to develop a mobile simulation laboratory, a Health Information Exchange (HIE) and a regional sexual assault nurse examiner program (SANE). Efforts are underway to fund a community diabetes education program and a LEAN collaborative for southeastern North Carolina. Prior to coming to Coastal Carolinas Health Alliance, Larry was the Executive Director of the Greensboro Healthcare Network, a physician-hospital, managed care, joint venture, with 330 physician providers and the Moses Cone Health System. He managed several large freestanding and hospital based medical groups in North Carolina and Illinois and was the vice president of a physician practice development company that established medical practices around the country. Larry has more than twenty years of hospital and health system operations experience in the role of Vice President of Operations, Executive Vice President and Senior Vice President in three not-for-profit community hospitals in the Midwest and the Southeast. “Larry Matheny and CCHA have been an asset to NCHN members,” said Rebecca Davis, Executive Director of NCHN. “He is always willing to share best practices, benchmark data and assist other members in times of need.” In April 2010, Matheny was also elected by the NCHN membership to serve on the NCHN Board of Directors. 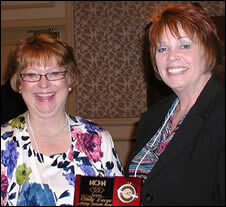 The Montana Health Network was selected nationally as the NCHN Outstanding Health Network of 2010. Chris Hopkins, Vice President of Strategy for the Montana Health Network (MHN), accepted the award on behalf of MHN and their CEO, Jan Bastian. The Outstanding Health Network of the Year Award recognizes a network that has improved access to health services in its service area and has improved the coordination of resources for members using particularly innovative and comprehensive approaches. Award winners were nominated and chosen by their national peers. Montana Health Network has numerous successful programs, including its education programs, temporary staffing pool and specialty staffing process, multiple employer 401(k) plan, insurance plans, and group purchasing. The network has also been instrumental in the development of telemedicine services in the region. In addition to its own programs, Montana Health Network has worked in partnership with other networks, including Northland Healthcare Alliance (ND), Western Healthcare Alliance (CO), Nevada Rural Hospital Partners, Health Future, Inc. (OR) to further programs in mobile imaging, medical collections, staff education, property insurance, and employee investigations. Established in 1987, Montana Health Network has thirteen employees and a temporary staffing pool of approximately one hundred and fifty (150). The network is governed by seventeen (17) core members in Montana and also works with forty-one (41) affiliates in Montana and Wyoming, which include mental health centers, nursing homes, community health centers, and physicians’ practices. Heman A. Marshall, III, Principal with Woods & Rogers Attorneys at Law, was the recipient of the first annual Friend of NCHN Award. In the past four (4) years, Heman Marshall, III, has contributed many hours of volunteer service to NCHN, including extensive work with the NCHN Board of Directors and By-Laws Committee. Marshall has presented at numerous NCHN Conferences and Regional Meetings and has provided training for Human Resources and Services Administration (HRSA) network grantees, in conjunction with NCHN’s annual conferences. As a Principal with Woods Rogers Attorneys at Law, Marshall has served as the Coordinator of the firm’s Health Law Practice Section since its inception in the early 1980’s and was the initial Chairman of the Virginia Bar Association Health Law Section and the Virginia State Bar Antitrust, Franchise and Trade Regulations Sections, and is currently a member of the Governing Counsel of the Virginia Bar Association Health Law Section. He has lectured extensively to attorneys and health care professionals and numerous topics. In addition, Marshall is a published author and is listed in the “Best Lawyers in American” under the categories of both Health Care Law and Antitrust. He was recently made a member of “Outstanding Lawyers of America” and s a fellow of both the Virginia Bar Foundation and the American Bar Foundation. 2010 Committees are forming! You should have already received an email with the description of 2010 Committees and a request to sign up to serve your Association. If you have not, and you are interested in serving on one of NCHN’s committees, please let Rebecca know ASAP. Subscribe to the OHITX Weekly News Brief info@ohitx.org We track and disseminate the new so you don’t have to! We look forward to serving you as a partner of NCHN. Until the late 1990’s, Lincoln County, Missouri was rural America. Today, it is the center of growth. When Lincoln County Medical Center, a 25-bed Critical Access Hospital, realized that suburban St. Louis was marching directly toward them, they knew help was needed with their managed care contracts. In conjunction with the contracting project, claim auditing and chargemaster projects were also undertaken, resulting in collections of over $900,000 and strategic pricing net increases exceeding $1,000,000 in two years. To learn more about MRS’ unique package of Revenue Cycle services, including Chargemaster, Business Intelligence and Managed Care, call 816-229-4887. Health Care Coalition of Lafayette County’s mission is to provide leadership in securing comprehensive services across the continuum of care. Their purpose is to monitor the availability and delivery of health care services, thus ensuring that all residents are informed about heath and wellness services in the region. The network offers a variety of programs and services to its members, including Health Information Technology, Access to Care, County Wide Insurance Plan, Health Lifestyles, and Transportation. The network was formed in 2006 and is comprised of 25 organizations in Lafayette County. Upper Peninsula Health Education Corporation is a new HRSA Network Planning Grantee and will be developing the network over the next year. The purpose of the planning grant is to establish administrative infrastructure and linkages across multiple programs. The network has three members, all located in Marquette. 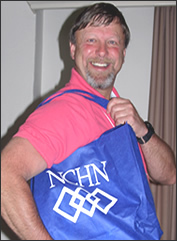 Congratulations to the winners of the door prizes at the closing of the NCHN 16th Annual Conference! We hope you enjoyed the conference and the door prizes! On Monday, April 5, 2010 at 2:00 PM, Governor of Virginia Bob McDonnell signed SB675, a bill which requires health providers to cover costs of telemedicine services (using interactive audio and video to diagnose, consult and treat patients.) To reinforce the law’s importance, this signing ceremony was broadcast from VCU Health System utilizing telemedicine video-conferencing technology to various telehealth locations in the state including five locations in the Northern Neck and Middle Peninsula. Medical specialists at the University of Virginia or Virginia Commonwealth University see patients of local Northern Neck or Middle Peninsula physicians using telemedicine video and diagnostic equipment. Images and data from the local offices are broadcast to the specialist in real time, allowing dialogue with the consulting physician, just as if the patient had taken the time to travel to Charlottesville or Richmond. Telehealth services provided in Virginia now include, but are not limited to, heart, skin, gastrointestinal, infectious disease, neurology (including stroke), pain management, pediatrics, psychiatry, lung, dermatology, gastroenterology, gerontology, infectious disease, neurology, and high risk OB/GYN. Patients must be referred by their primary care physicians. Members of NNMP Telehealth are: Riverside Tappahannock Hospital, Rappahannock General Hospital, Riverside Walter Reed Hospital, Westmoreland Medical Center, Middle Peninsula Northern Neck Community Services Board, Family Maternity Center of Northern Neck, Bay Aging, Central Virginia Health Services, Three Rivers Health District, UVA Offices of Telemedicine, VCU Telemedicine, and Virginia Health Quality Center. The organization has broadened its reach with its newest member, Riverside Shore Hospital on the Eastern Shore of Virginia. For more information, contact Edie McRee Bowles, Northern Neck Middle Peninsula Telehealth office - 804-443-6286. Wednesday, May 5, 2010 - The city of Jeffersonville has spent weeks trying to move the Star of Jeffersonville’s ticketing barge from the city’s riverbank. Mother Nature did the job for it Wednesday evening. The barge capsized away from the bank at about 6:30, according to Jeffersonville Mayor Tom Galligan, and dozens of spectators lined up under the John F. Kennedy Memorial Bridge to watch the free water show. Looking for more NCHN event dates? 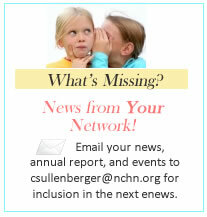 Find Quarterly Conference call dates and others in the Members Only section of the NCHN website. Mark you calendar and save the date! The President’s Council of Economic Advisers has released a 47-page report entitled “Strengthening The Rural Economy.” The report highlights the Administration’s accomplishments, as well as the President’s analysis of rural issues and his plans for rural America. To get a copy, control+click on http://www.whitehouse.gov/sites/default/files/Rural%20America%20final-v9.pdf. The New York Times ran a story about thousands of non profits projected to lose their 501(c)3 status on May 15 this year because of a new law that goes into effect on that date. An estimated one-fifth to one-quarter of some 1.6 million charities, trade associations and membership groups will lose their tax exemptions, thanks to a provision buried in a 2006 federal bill aimed at pension reform. To read the article, go to http://www.nytimes.com/2010/04/23/us/23exempt.html?emc=tnt&tntemail0=y. Part-time clinicians can now receive up to $50,000 in loan repayment in exchange for a four-year service commitment to the National Health Service Corps (NHSC). Applications are due by 5:00 p.m. EDT May 25, 2010. U.S. Department of Health and Human Services Secretary Kathleen Sebelius announced today that more than $267 million has been awarded to 28 additional non-profit organizations to establish Health Information Technology Regional Extension Centers (RECs). This investment, funded by the American Recovery and Reinvestment Act of 2009, will help grow the emerging health information technology (health IT) industry which is expected to support tens of thousands of jobs ranging from nurses and pharmacy techs to IT technicians and trainers. RECs enable health care practitioners to reach out to a local resource for technical assistance, guidance, and information on best practices. RECs are designed to address unique community requirements and to support and accelerate provider efforts to become meaningful users of electronic health records. This round of awards, bringing the total number of REC’s to 60, will provide nationwide outreach and technical support services to at least 100,000 primary care providers and hospitals within two years. The primary care provider is usually the first medical practitioner contacted by a patient. Studies have also found that primary care providers are at the forefront of practicing preventative medicine, a key to improving population health and reducing overall health costs. More than $375 million had been awarded earlier to RECs under this program. Additionally, all REC awardees, those announced today and the 32 announced on Feb. 12, 2010, now have an opportunity to apply for a two-year expansion supplemental award. The supplemental awards would ensure that health IT support services are available to over 2,000 of the nation’s critical access hospitals and rural hospitals, both defined as having 50 beds or less. Approximately $25 million is available through this supplemental expansion program. “Regional extension centers will provide the needed hands-on, field support for all health care providers to advance the rapid adoption and use of health IT. RECs are a vital part of our overall efforts to improve the quality and efficiency of health care through the effective use of health IT,” said Dr. David Blumenthal, national coordinator for health information technology. Today’s awards are part of the $2 billion effort by the American Recovery and Reinvestment Act of 2009 to achieve widespread meaningful use of health IT and provide use of an electronic health record by every person by the year 2014. Complete listing of REC grant recipients and additional information about the Health Information Technology Regional Extension Centers, see http://HealthIT.hhs.gov/programs/REC/. Awards totaling $84 million to 16 universities and junior colleges will support training and development of more than 50,000 new health IT professionals. Additionally Strategic Health IT Advanced Research Projects (SHARP) awards totaling $60 million were provided to four advanced research institutions ($15 million each) to focus on solving current and future challenges that represent barriers to adoption and meaningful use of health IT. Both sets of awards are funded by the American Recovery and Reinvestment Act of 2009. Today’s awards are part of the $2 billion effort to achieve widespread meaningful use of health IT and provide for the use of an electronic health record (EHR) for each person in the United States by 2014. For information about other HHS Recovery Act programs, see http://www.hhs.gov/recovery. In the past few years, the number of health center sites has increased dramatically. Today, there are more than 1,500 community-based health center grantees in some 7,500 service delivery sites across the Nation with a third located in rural communities. As the health centers have grown, so have the numbers of Critical Access Hospitals which are a lifeline to rural residents in need of health care. With health centers and Critical Access Hospitals both facing increasing demand for services, the need for collaboration has never been greater. Our goal, at HRSA, is to encourage strong partnerships between community health centers and Critical Access Hospitals. We know that collaboration is not always easy, and it is our hope that this manual -- Effective Collaboration Between Critical Access Hospitals and Federally Qualified Health Centers -- can help to promote the many benefits of working together. The manual looks at collaboration from a variety of angles. It covers all the basics and highlights three success stories. In addition to this manual, HRSA is also taking other steps to promote collaboration among rural safety net providers. We are working to allow State grantees in the Medicare Rural Hospital Flexibility grant program to use that funding to promote collaboration between community health centers and Critical Access Hospitals, and we are also looking to revise the new access points guidance for community health centers to promote collaboration among all existing safety net providers. Please visit www.hrsa.gov where you can get a copy of this manual or give us a call at 301-443-0835. Aimed at empowering individuals to take initiative in improving their communities, the Post Grant for Good Health will award $25,000 to the plan for the best health and wellness community project. From planting public gardens, to building a playground to creating a fitness center, applicants can submit their 300-word essay until May 17, 2010. Post and the National Wellness Institute will help select the top finalists, who will be featured on PostNatural.com, where the public can vote for the project they find most meaningful from June 1 to July 12, 2010. The winner will be announced at the 35th Annual National Wellness National Wellness Conference in Stevens Point, Wisconsin, July 22, 2010. Have an idea for improving your community? Get started by visiting PostNatural.com for entry details.